Passengers are welcome to board our ship at 3:00 p.m. We'll set out to discover the Christmas markets in Strasbourg. After returning on board, we'll introduce our crew at a welcome cocktail before dinner. Enjoy a "Christmas Tales”-themed evening. The morning will be spent cruising on the most beautiful section of the Rhine. Join us for a guided tour of Cologne or enjoy some free time in the city. Tonight is our Christmas Eve dinner and evening. Midnight mass will be celebrated in Cologne(1-2). Our ship will sail through the night. The whole day will be spent cruising towards Amsterdam. Tonight is our gala dinner and evening. Join us for an excursion to Volendam and Zaanse Schans. In the afternoon, enjoy some free time or join us for a guided tour of Amsterdam. 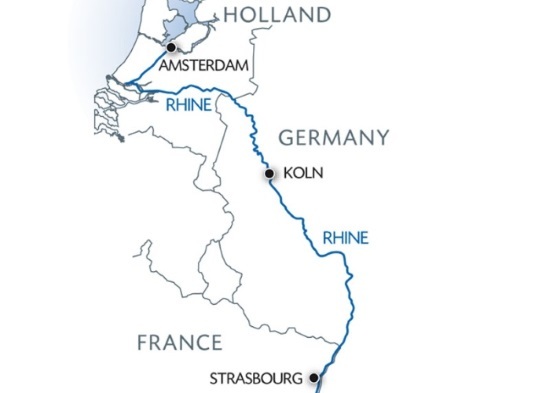 Enjoy a unique cruise on the Rhine River from Strasbourg to Amsterdam and immerse yourself in Christmas magic! You will discover the famous Christmas market in Strasbourg with local crafts, mulled wine and much more. Christmas Eve dinner will be followed by a most memorable Christmas Mass in Cologne before continuing to Holland.